For your consideration, a 14K owl tie tac or pin with emerald eyes. This was an EBAY buy and has been in a box pretty much since I got it. It's a cute little piece and a fun piece to wear. Email me with any questions you may have. Thanks for looking! Shipping to US address confirmed only by paypal it is a final sale. This is a wee little baguette that really packs a punch. It's in the security plastic from GIA still so not the easiest to photograph. 2.41 x 1.50 x 1.27 mm .04 Natural Fancy Intense Pink tapered baguette with even distribution. Finding comps is difficult due to the scarce nature of these but I believe current retail value is just over $2,000. The GIA report is available here: http://www.gia.edu/cs/Satellite?pagename=GST%2FDispatcher&amp;childpagename=GIA%2FPage%2FReportCheck&amp;c=Page&amp;c id=1355954554547&amp;reportno=2145142319 Buyer pays shipping. Sale is final. This is an authentic Tiffany &amp; Co 18k Rose Gold Small Key. It measures 1.25" and 1.5" with bail. Retail is $500. It's in very good condition and will come with a Tiffany pouch. Sale is final. Includes shipping to US. 1.48 ct Grossular Garnet cut by Gary Braun of finewater Gems. I bought this lovely mint 4 years ago. This color is getting much tougher to find. From the original listing: My broker in Kenya found me a slightly yellowish-green grossular garnet that I've cut into a classic oval Barion design. The name grossular is derived from the botanical name for the gooseberry, which is similar in color (I know this for a fact - we had them on my parent's farm!). Typical of many grossular garnets from this region, it fluoresces orange under UV light (especially the 405nm wavelength). Eye-clean with lots of sparkle and flash. 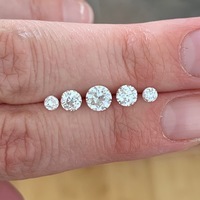 1.48 ct, 8.4 x 5.3 x 4.7mm, VS clarity Pair of oval diamonds One is .33 G-H VS1 and the other is a .27 G-H I1 Sale is final. Buyer pays shipping. 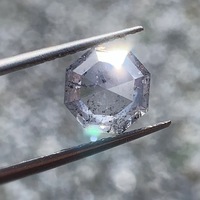 2.18 Old mine cut diamond in platinum setting. Estimated at O/P color and SI2 clarity by qualified old stone dealer. Measures 8.19 x 8.31mm. Set in platinum setting with single-cut melee in halo; finished ring weighs approximately 9.15 grams. Currently size 7 full, but sizeable. Asking $9350 plus ship/insurance; I'm a private seller thinning out collection, so sale is final. Please feel free to ask questions. Looking for a simple, good quality yellow gold chain suitable for man. For anything to unload? Authentic Chloe Paddington in rare burnt orange color. This bag is beautiful but I need to stop buying Chloe bags lol. Searched high &amp; low for this color, there aren't many out there. There is normal wear &amp; tear on the bag and it comes with the dust bag. $300.00 plus $12 shipping Please ask any questions before buying, final sale :) I'm Olivejuice on most forums. Paypal only, shipping within the US but email me for shipping prices elsewhere. Thanks for looking! This is a sparkly spinel ring with great finger coverage due to the halo setting! The photos appear washed out, unfortunately. A very well cut stone and the setting even has lovely profile scrollwork. I am selling because I have the twin to this pretty spinel and I'm willing to let this one go to fund some upcoming projects. Center stone: Precision cut 5.5mm Burmese spinel Setting: 14k white gold ring I purchased at BIN price (not auction) from LOGR. Nice white, sparkly melee. Size 4.25-4.5, but easily sized by your jeweler. NOTE: one of the diamond melee in the setting is missing. You could have a jeweler replace this, but it never bothered me enough to do it because it is the second lowest stone on the side/band and not at all near the halo area. Otherwise in great condition, as I had this made a year ago and only wore it to dinner a few times. Please ask all questions before buying! I've bought and sold on this site and on DB, and I'm happy to provide references if needed. :) Please add $10 to help me cover tracking, insurance, and Paypal fees. US buyers only, please, as I don't feel comfortable shipping abroad. Dainty but strong single prong diamond band 1.75 mm width. Beautiful with engagement ring or by itself. Letting it go because it is a little too small on me. 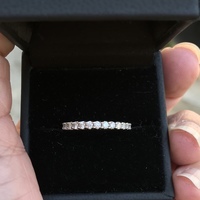 The ring is Size:5.25 and can be resized Natural White Diamonds: .21cts Color: G Clarity: SI1 Total # Of Stones: 12 Cut: Round Type of Metal: 18K Solid Yellow Gold Gram Weight: 1.49 Grams Please note, I am selling only the diamond band and not my engagement ring. All sales are final so please ask questions before paying. I accept Paypal and will ship for free within Canda and US. Up for sale is .80 ct N colored diamond that I’ll conservatively call an I-1. It has a fracture visible in the table that doesn’t affect light return or structural integrity. This stone was recut by Brian Gavin to his usual beautiful specs. I’ve attached the Sarin report. I don’t have a grading report, but it’s cut to AGS0 specs. The N color was graded my Jonathon at Good Old Gold. You get only the loose stone, setting not included. It’s a very pretty, firey stone with light brown tint. Please ask any and all questions before you buy, this is a final sale. Paypal confirmed addresses only. Free shipping to the USA. I’ll be shipping this stone from an APO, it’ll take 2 or 3 weeks to get to you. $2000 includes insured shipping to you. Expect to sign for the package. This is a beautiful pair of omega back earrings in 14k white gold-hallmarked. The earrings are in great shape, the backs are extremely secure. The pearls are no doubt freshwater. The black and white pearls are lovely together and these get a lot of comments. They dress up and outfit with ease and are incredibly comfortable to wear. Asking $55 which includes priority shipping in the US. Paypal preferred. Size 6.5 palladium Sophie setting with pave 3/4 around. Holds a 7-7.5mm stone. was only set one time. I thought this was the setting I wanted, but I found the one that has all the qualities I am looking for so this one is up from grabs. Brand new this setting would cost more than this, the sophie with a plain shank starts at 1795, and this one is palladium with 3/4 pave! IT is a great deal. Contact me with questions, I am willing to entertain offers. AS a private seller this is a final sell. Insured shipping is covered in the asking price. Diamond originally sourced from Wink, worn as a diamond stud earring. AGS ideal cut proportions. Comes with original AGS grading report - full stats below: Carat: 0.57, J, SI2 Depth: 61.5 Table: 56 Crown Angle: 34.9 Crown %: 15.4 Pavilion Angle: 40.8 Pavilion %: 43.0 Girdle: 0.9-1.7%, faceted Polish: VG Symmetry: Excellent Culet: None Fluorescence: Strong Blue Measurements: 5.34-5.36X3.29 I'm a private seller, so sale is final. Please feel free to ask questions. This is a gorgeous custom made strand of lustrous white south sea pearls, silver Tahitian keshi pearls and sterling silver beads from Jose at tahitianpearls.biz. Unfortunately since I'm currently a stay at home mom of three, I don't get much wear out of it. I've only worn it once! It is about 37 inches long and was initially made into a lariat, but I switched out the largest pearl with a pretty pearl clasp. It can be worn long or doubled. The original thread is here where you'll find lots more photos: http://www.pricescope.com/forum/pearls-new/exciting-new-pearl-necklace-project-t189300.html It was made using two separate pearl strands. The sizes given to me by Jose were: SS: 10.2mm to 13.8mm (the largest pearl has been removed) Keshi: 8mm to 12.2mm (considered large for keshi!) This strand can potentially be taken apart to create two separate strands of keshi and white SS pearls. These are the earrings, current price $4200: http://www.bluenile.com/diamond-hoop-earrings_6856 2.25 Ctw inside/outside hoops. Measures a bit over an inch. Each stone is 4 points each. 18k white gold I have a baby who loves to grab things and these earrings don't fit into my daily wear anymore. I figure they need a new home so they can be worn and loved. They are in perfect condition and I always received compliments when I wore them. Please let me know if you have any questions or need more pictures. I will include the original box and appraisal. No returns. ReDuCed!! Princess cut Aquamarine pendant, diamond accent, white gold! Was $99, now only $65! This is a steal! Beautiful Princess cut Aquamarine and diamond accent pendant, a little bit David Yurman style with the thick shiny white gold surround, opening in back as shown to let light through for more sparkle! 10k white gold. This is a steal at $99! Beautifully cut aquamarine! Only worn a few times! Does not come with chain (chains are easy to get you can get a 10k gold one at walmart for $38, or a sterling one for $9!). Paypal only, add $10 extra for priority shipping &amp; Paypal fees. Does not come in box shown in photo (did not get from ice.com just used an old box for pics), but they sell boxes similar for $1.30 on storesupply.com Thanks! Final sale also all my listings come from smoke free, pet free home!